Kolam images from NCC Gallery announcement for Bruce Wall & Josh Miller's exhibit. The images above are from a postcard that appeared on my desk a few weeks ago. 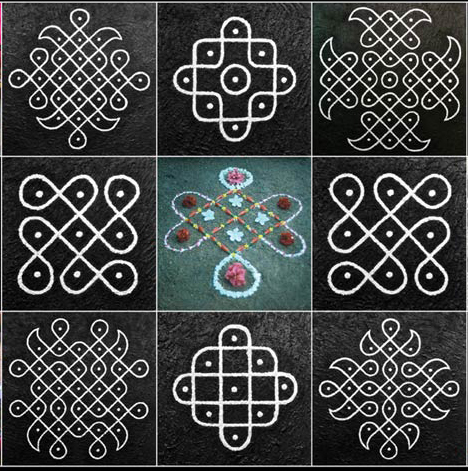 I’d never heard of the Indian art form called Kolam, even though I spent some time in India long ago. Luckily, or perhaps due to good karma, I was able to attend the opening of a remarkable exhibition devoted to Kolam at Northampton Community College. 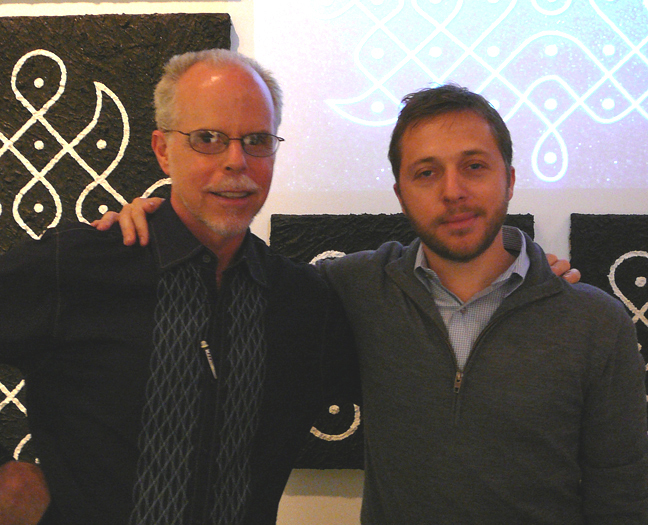 The Art of Indian Kolam is a collaboration between two NCC profs, Bruce Wall and Josh Miller. In 1980, Bruce Wall was awarded a Fulbright grant. 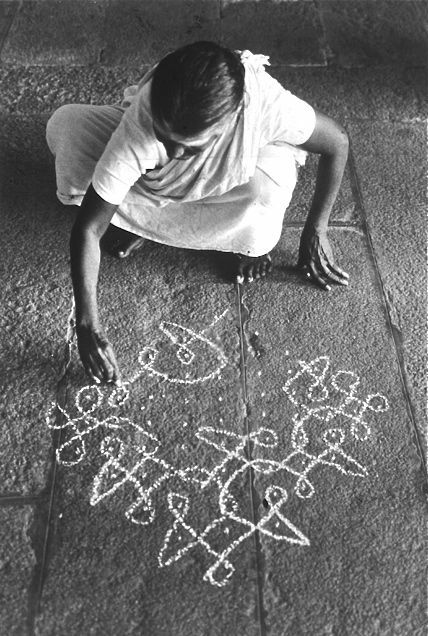 Along with his wife, KU Prof. Rhonda Wall, he traveled to Tamil Nadu in Southeast India to document these ephemeral geometric folk designs. Josh Miller, who teaches web design and motion graphics, is responsible for several magical high-tech interactive aspects of the exhibition. Most notably, Miller engineered an interactive computer program that permits gallery-goers to design their own digital Kolam. 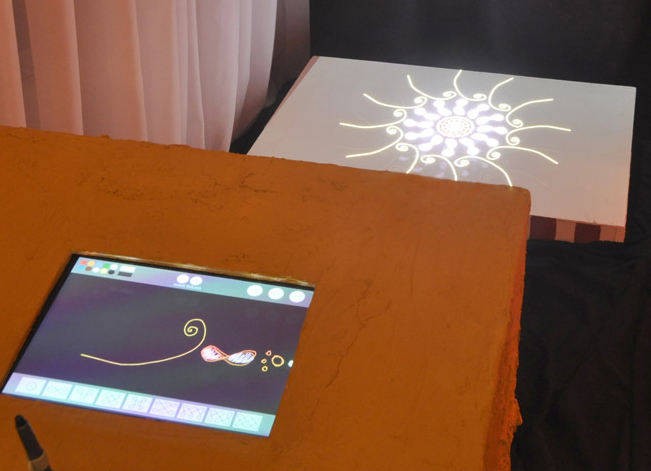 The Virtual Kolam drawing station, photo from exhibition website. These new designs are uploaded instantaneously to an electronic wall display and digitally archived. This aspect of the exhibition is clearly a hit with the art students. Miller had said he had hoped for 40 or so viewer-generated digital Kolam, that number has been long surpassed, and several hundred designs have already been uploaded. We missed his lecture but Bruce gave us a shortened version. Kalom are ritual designs drawn daily outside rural households. What looks like chalk is, in fact, a finely ground rice flour mixed with spices. Like the PA German hex signs we see in Eastern Pennsylvania, Kolam are more than simply decorative. The designs protect the household from bad karmic vibrations. Also like hex signs the designs, whether simple or complex, are constrained by a traditional geometry. Villagers take the daily ritual quite seriously. Wall met a couple of Frenchwomen who had rented a small house in Tamil Nadu and agreed to their landlady’s one rule, -they were to create a Kolam daily. These two woman apparently were perfectionists and embarrassed by their failed attempts at Kolam. After a few days they gave up trying. The Indian landlady ran into the house waving her arms. She screamed, “You must make the Kolam! You must.” The Frenchwomen came up with a culturally appropriate work-around. They hired a young neighbor girl to make their Kolam. This is a fascinating exhibition about a little known art form. If you are in the area, do check it out. If you are not nearby, check out the excellent interactive website. The Art of Indian Kolam exhibit runs through October 23. The Gallery, Communications Hall, Northampton Community College, Bethlehem Township, PA. Weekdays: 8am -10 pm & Saturdays: 9-5.